"The NIST report represents what can really only be called anti-science. They started with their conclusion and worked their way back to some leading hypothesis." 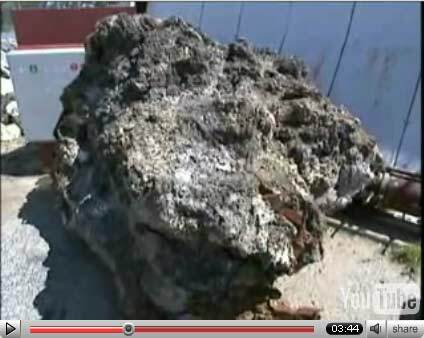 "Here is the meteorite - molten iron fused with concrete." "Architects, engineers, people who work with steel - welders - have just never seen the level of destruction and the level of deformation of this material in their lives." "As I stood there on the 33rd floor, I heard very strange noises on the 34th floor. now, the 34th floor was an empty floor - a floor that did not have any kind of walls, it was a construction floor. It was totally hollowed out there was nothing there . . . not even the elevators stopped there. You had to have a special access key to open the door on the 34th floor"
There are some very interesting clips in this short film, be sure to check it out for some things you might not have seen before. Hat tip to whatreallyhappened.com for the link! The events of the 5th anniversary 9/11 weekend made it known to the Establishment that 9/11 truth is here to stay, and they are fighting back in full force. James Meigs and his Popular Mechanics propaganda engine have gone on a media tour, often appearing unopposed to scoff at "conspiracy theories". In addition to our current level of activism, in addition to our street actions, we need to accelerate what we are doing in such a way as to completely neutralize media hit pieces. As the 9/11 media hit pieces increase and government/Establishment hired scientists and engineers are trotted out to explain the impossible, we need to bring a stronger degree of scientific credibility behind the controlled demolition thesis. A recent Scripps Howard poll stated that 36% believed that it was at least somewhat likely that elements of the government were complicit in 9/11. We need the same to happen in the scientific community with regard to the suspicious collapses of the towers. Let's initiate a 9/11 Science Campaign aimed specifically at scientists and engineers. Let's reach out to the scientists and engineers, the vast majority of whom probably have little or no memory of what the WTC collapses looked like, the vast majority of whom have probably never heard of WTC 7. Send them copies of "Why Indeed Did the WTC Buildings Completely Collapse?" and "Waking Up From Our Nightmare". 1. To not do so would be to ignore the obvious - that fire does not cause a steel framed skyscraper to collapse symmetrically, shred itself into fine dust, create rivers of molten steel, and generate such intense fires and heat that persisted into the winter. It should not take a PhD to point this out, but in the infowar, it raises our stature in the eyes of the general public to hear an army of engineers coming forward. 2. It gives us an accelerated credibility that truly lets us leverage our efforts, especially compared to reaching out to the layperson. 3. To protect and validate the brave scientists and engineers who have already gone public. Engineers and college professors who speak out are being ridiculed and sometimes punished for their 9/11 beliefs. Clearly, the Establishment is trying to make an example of people who dare to challenge the official 9/11 fable. But they cannot do this to the 9/11 truth movement if professors speak out in much greater numbers. Cries of "conspiracy theory" by writers such as Alexander Cockburn will ring hollow against an army of serious scientists (not that he'll stop trying). I graduated from an engineering school sometime ago (Cooper Union, B.S. in Electrical Engineering, 1999). I've started with my Alma Mater, in sending out a copy of Jones' paper to some of my professors, and encouraging them to take a closer look at 9/11, in the hopes that more will speak out. I implore everyone to do the same with universities and companies in the U.S. and abroad. Monday Sept. 11th from 6pm to 9pm at the St. Joseph County Public Library in South Bend - Kevin talks at 6pm, followed by a showing of Griffin's speech "9/11 and the American Empire" at 7pm. SOUTH BEND — Kevin Ryan doesn’t mince words when it comes to 9/11 — he just doesn’t buy what he calls the “official story” of it. Ryan, who lives in Bloomington, will bring that message to South Bend on Monday, the fifth anniversary of the 9/11 terrorist attacks. He plans to share his personal story of why he speaks out on the topic, which began in 2004. That’s when Ryan was fired from his job at Environmental Health Laboratories Inc. in South Bend, a subsidiary of Underwriters Laboratories Inc. He now works as an engineer for a pharmaceutical company. The firing came after Ryan wrote a letter to the National Institute of Standards and Technology, which was probing the collapse of the World Trade Center’s twin towers.